File contains postcards of North Bay and other locations in and near the Nipissing District including: the French River, Lake Nipissing, Trout Lake, Lake Nosbonsing, Sturgeon Falls, Mattawa, Nipissing, Callander, Lavigne, Bonfield, Monetville, Saint Charles and Port Loring. 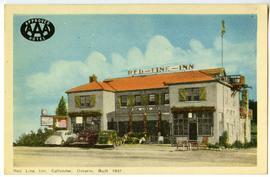 The postcards depict: tourist attractions (such as parks, lakes, beaches, rivers, and waterfalls), tourist accommodations (including hotels, cottages, resorts, and camps), city scenes and buildings (including schools, railway stations, churches, municipal buildings, hospitals, and factories), the Dionne Quintuplets, the Chief Commanda steam ship, and trains. File also contains a few postcards of other places including Temagami, Timmins, Cobalt, Lake Superior, Pembroke, Haileybury, Owen Sound, and Prince Rupert, BC. 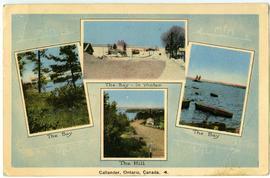 File additionally includes several souvenir folders containing postcards of Ontario, North Bay, and humorous cartoons.